Anytime we are approaching a new project, a major decision to make is flooring. The options truly are endless, which is what makes selecting flooring so much fun! From tile and carpet to wood, flooring makes a big impact in the overall feel of your home. Read on for our tips and tricks to selecting flooring. 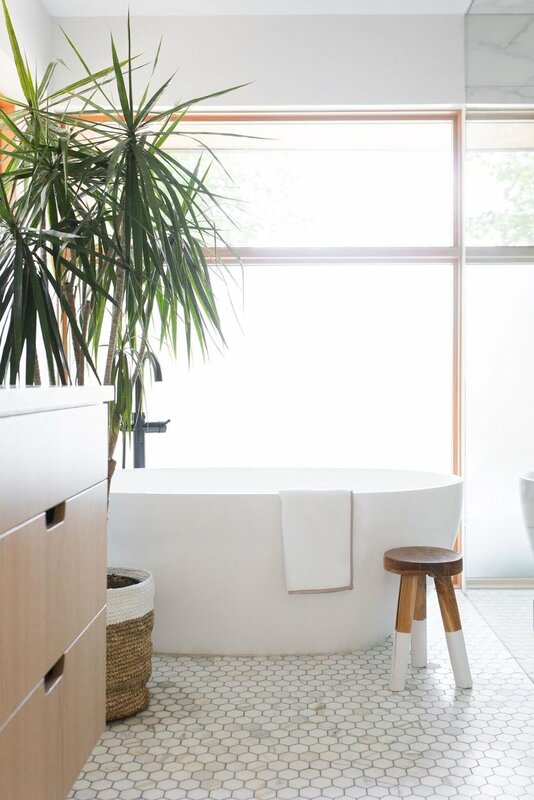 We love wood anywhere that doesn't get really wet; for example, we wouldn't typically put wood in a mudroom or in a bathroom with a tub/shower. It is great for kitchens, family rooms, dining rooms bedrooms, hallways, powder bathrooms, etc. It's timeless, beautiful, adds warmth, adds value, goes with any style of home/decor, and has a long lifespan. But it can be pricier than other flooring options, picking stains for solid wood is tricky, it may need re-sanding/re-staining down the road, and softer woods can show scratches from pets, dragging furniture, etc. Read this post for a complete list of pros/cons to solid vs. engineered wood. Tile is great because there are an endless variety of styles, colors, materials, grout colors, patterns to lay it in, etc. You can never get bored with tile floors! We love tile in mudrooms, laundry rooms, bathrooms, and even sometimes in kitchens. This is the perfect option for any space that will get wet and dirty all the time. You can get great tile on a budget, tile is usually very durable (depending on what you select), it is easy to clean/maintain, and there are lots of patterns for laying tile. But it has a cold underfoot, it can be slippery when wet, and certain tiles are more porous and will require more maintenance (ie: marble tiles and cement tiles). Design by Kelly and Co.
Why so many people love carpet is a no-brainer: it's warm, soft, and cushy underfoot. We love to use carpet in bedrooms, stair runners, and lounge areas -especially if they are in basements with cement sub-floors (which are very cold!). Carpet is soft, comfortable, warm (physically and visually), it dampens sounds/echoing in a room, there are lots of colors/patterns available, and it is cozy for kids to play on. But staining is more likely (although there are lots of carpets with stain-resistant finishes on the market today! ), wear patterns are usually more visible over time than on hard surfaces, and it can look/feel cheap if you don't select a good quality carpet. 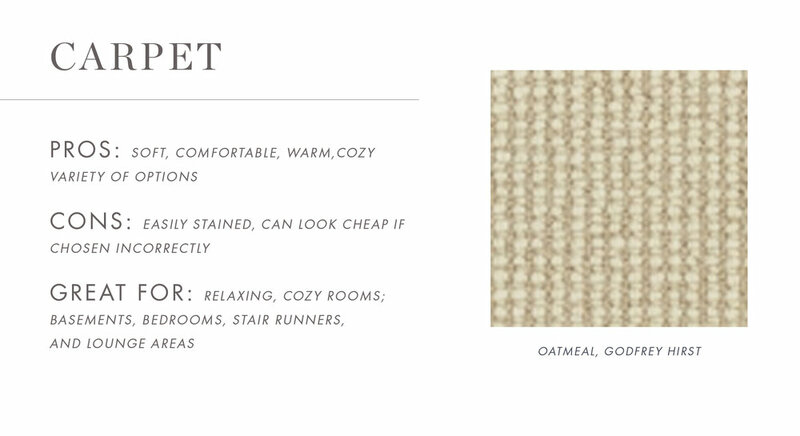 We typically suggest wool or a wool blend for high-quality and durability!